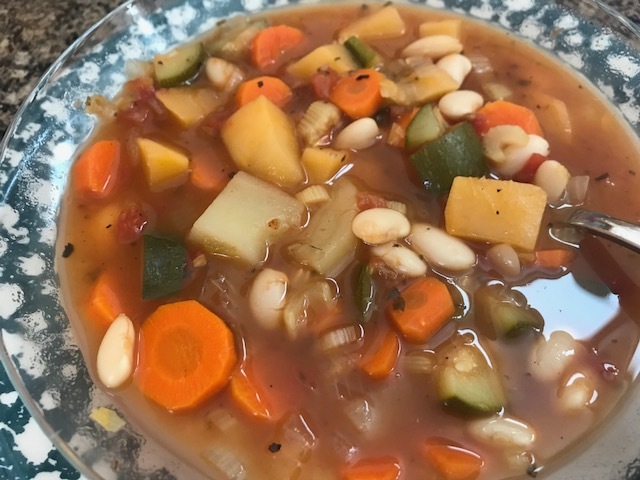 The soup recipe I'm sharing today is a very far cry from a dish of beans and rice. Actually, there's no rice in the soup. 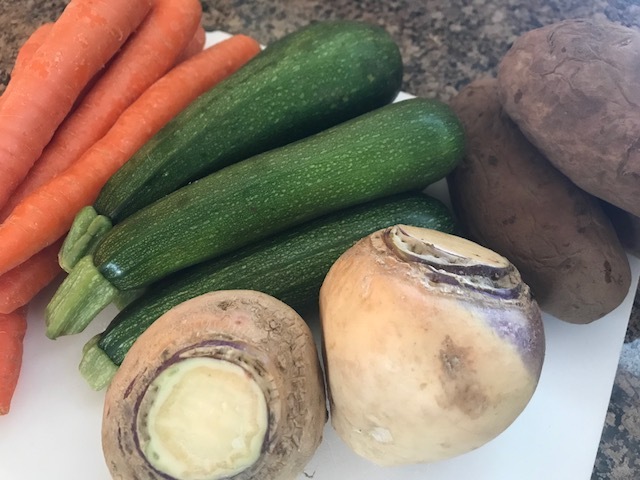 Instead, it's filled with fabulous fall vegetables, carrots, zucchini, purple top turnips, potatoes, and a bag of large white beans. There is a little surprise ingredient, and that's an onion that is studded with 8 cloves. 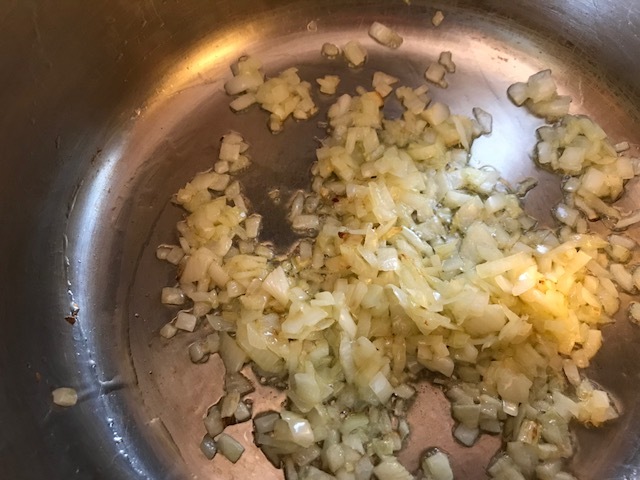 The onion is cooked along with the beans and vegetables, and then discarded once the soup is ready. This is something that my grandmother would do, and it really adds a wonderful richness to the soup. 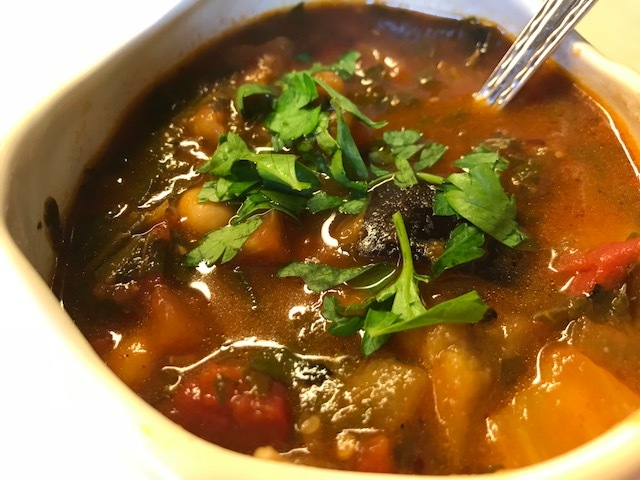 This soup is a great dump and go recipe. Just chop up all of the vegetables, throw them in a big pot with the white beans. It's also a great soup to make in a crockpot. Below you can see the clove studded onion cooking along with the vegetables. I wish there was smell-o-vision!!! The soup is perfect for a cool fall evening. It will freeze well, so eat half and save the rest for another meal. Rinse beans and soak overnight. Drain and rinse beans. 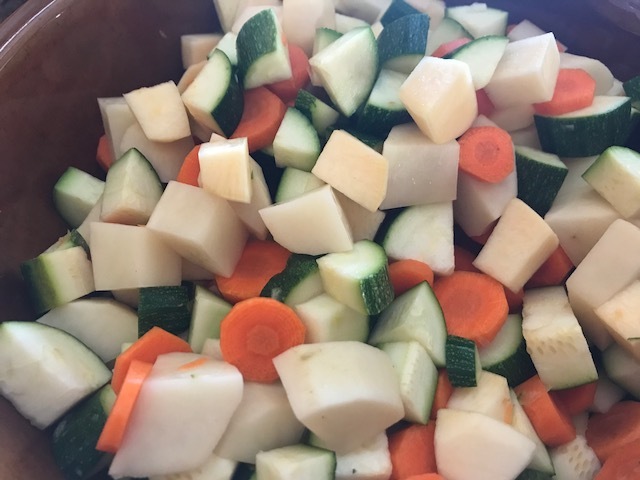 Place in a large pot with vegetable broth. Bring to a boil. Chop all vegetables except the onion studded with cloves. Place all vegetables in soup pot. Add tomatoes(do not drain), studded onion, basil, oregano, bay leaves, red pepper flakes, and salt and black pepper. Return to a boil and then reduce heat to simmer and cook for 3 hours, or until beans are tender. 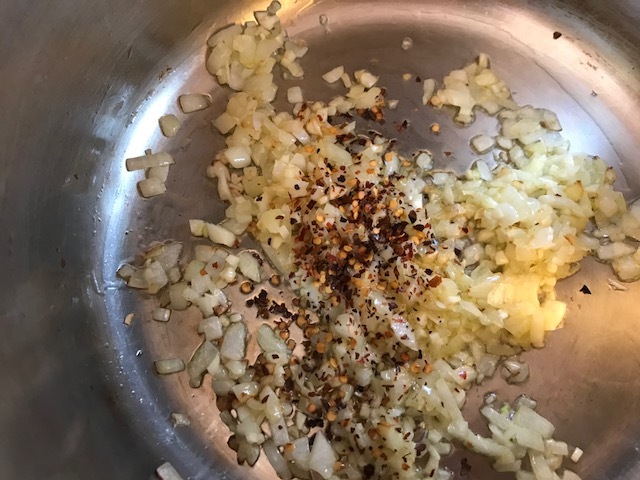 Before serving, remove clove studded onion and the bay leaves. Serve with crusty garlic bread and enjoy! Place all ingredients in crockpot. Cook on low for 8 hours. Hope you enjoy the soup...and the beans as much as I do! Monday Morning Inspiration/Put a Stripe In It! Last Saturday marked 9 weeks since little Mr. Berkley came to live with us. 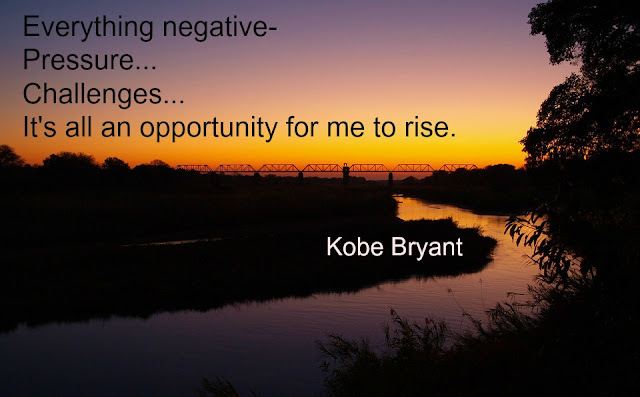 What a joy he has been. I don't think I've stopped smiling in the last 9 weeks! He has brought so much joy into our home, and without doing anything more than just being himself. This morning as I drank my tea, I sat and enjoyed watching he and Gracie race from 1 end of the house to the other. One chased the other, and when they came to the wall, they turned and the other was in the lead. Hilarious! Then they would stop, breathe heavily for a moment, and then off they would go again. Berkley has brought Gracie back to life, warmed my heart, and put a smile back on my face. I'll never know, but I think it's his way of simply saying thank you. 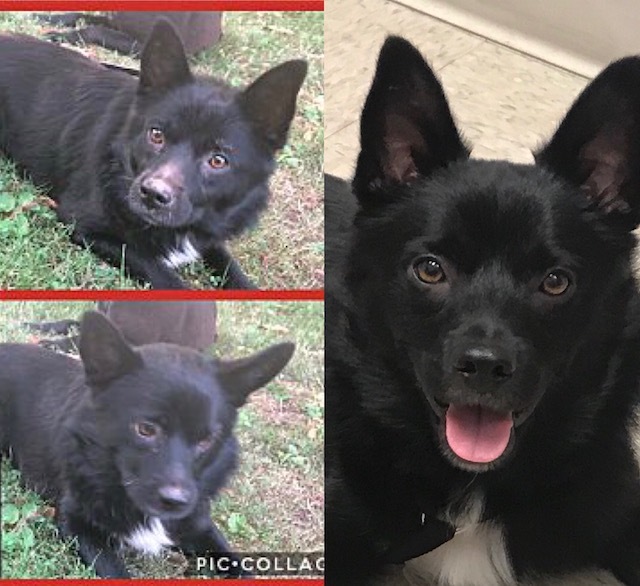 On the left is the picture I saw on the internet prior to adopting Berkley. He's dirty, and now that I know him, I can see that he is afraid. On the right...pure joy! It's interesting how athletic wear has permeated every aspect of today's fashion. 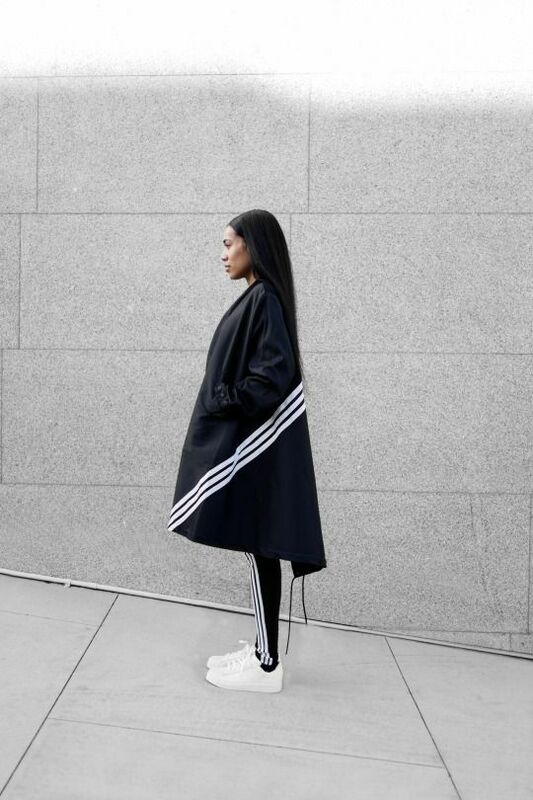 It's no longer relegated to just the gym, you see athletic inspired details in pants, tops, dresses, jackets, and coats. An athletic stripe is a perfect detail to add interest and elongate the body. 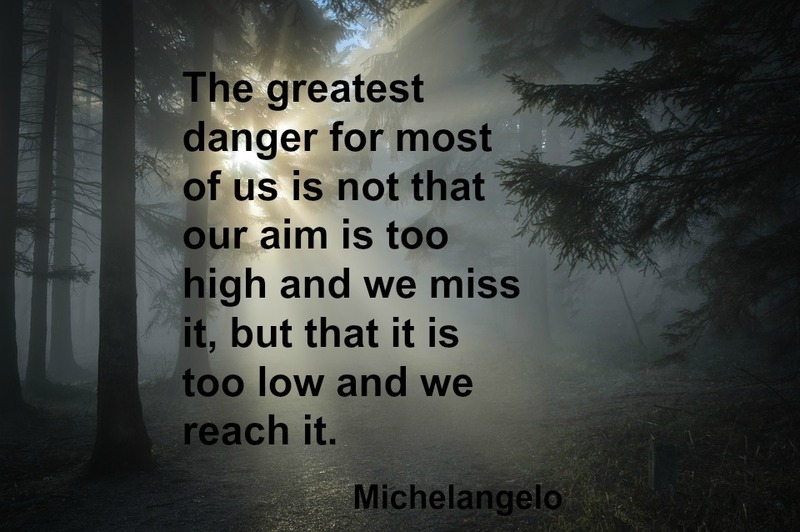 I recently came across this picture and fell in love! I love the little flounce on the back of the top, the stripe that curves across the back and then radiates into the stripe on the pant. The only change I would make would be to eliminate the stripe around the bottom of the pant. Another soft, flowy top with a athlesure inspired pant. The stripe that runs down the pant leg is repeated simply in the band on the sleeve. This ensemble is from Addias. 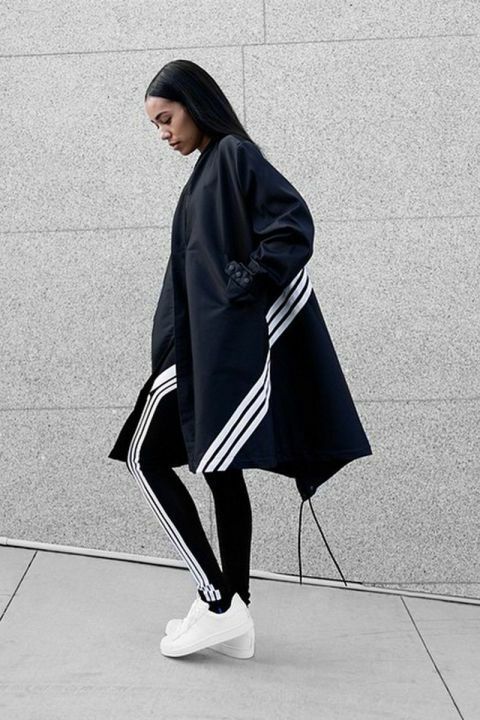 I love how the stripe curves across the back of the jacket and then elongates the body by bringing the eye down to the stripe in the pant. This piece is just so lovely. The soft ruffle that is sewn into the stripe on the blouse and then brought into the pant. This piece makes me long for a cool day. 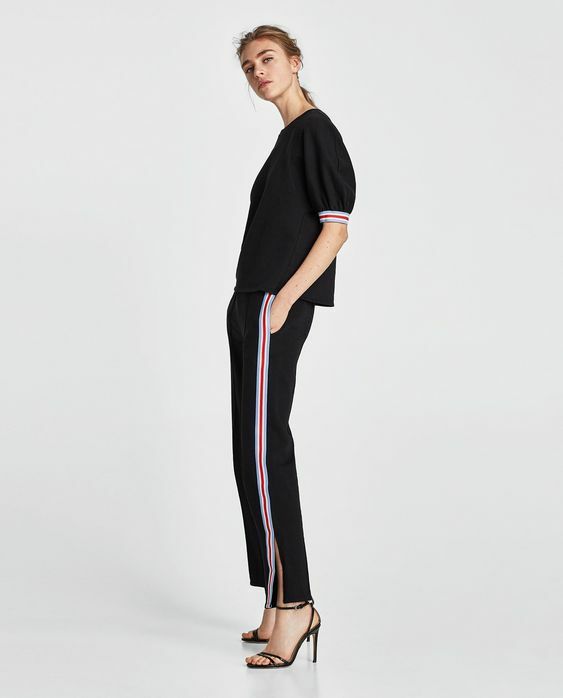 The stripe runs down the sleeve and then down into the pant. 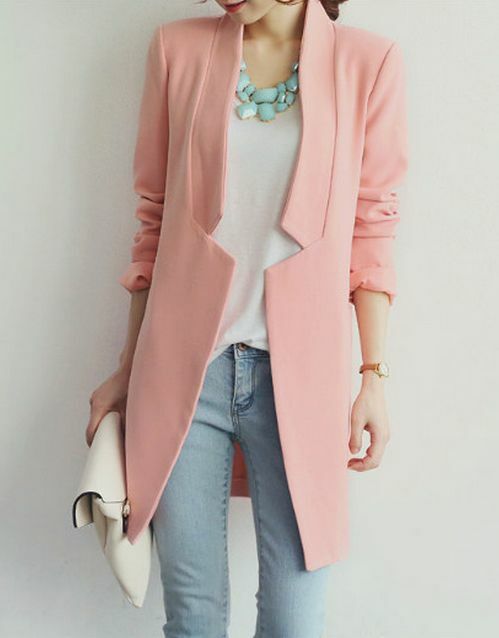 Love the play on color blocking too. 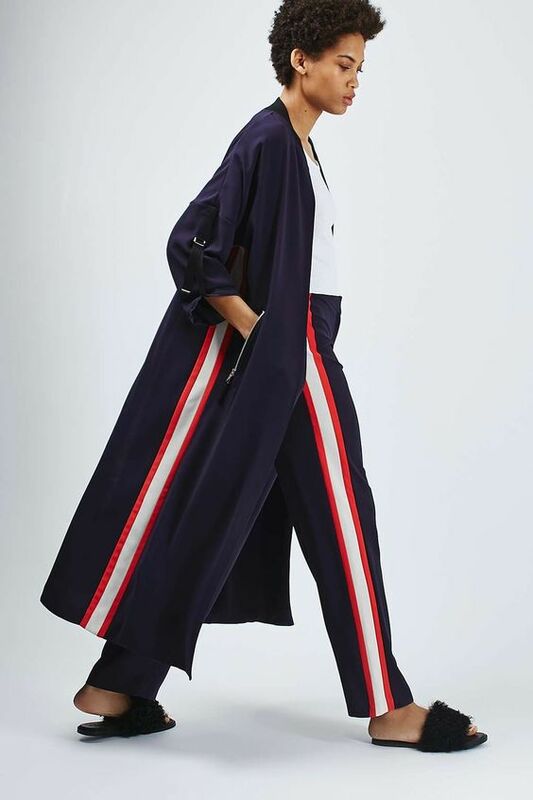 Love the echo of the stripe in the duster, and then in the pant. Here the stripe has been added to a dress. Although it's a rather wide stripe, it blends in so beautifully with the plaid in the main fabric. 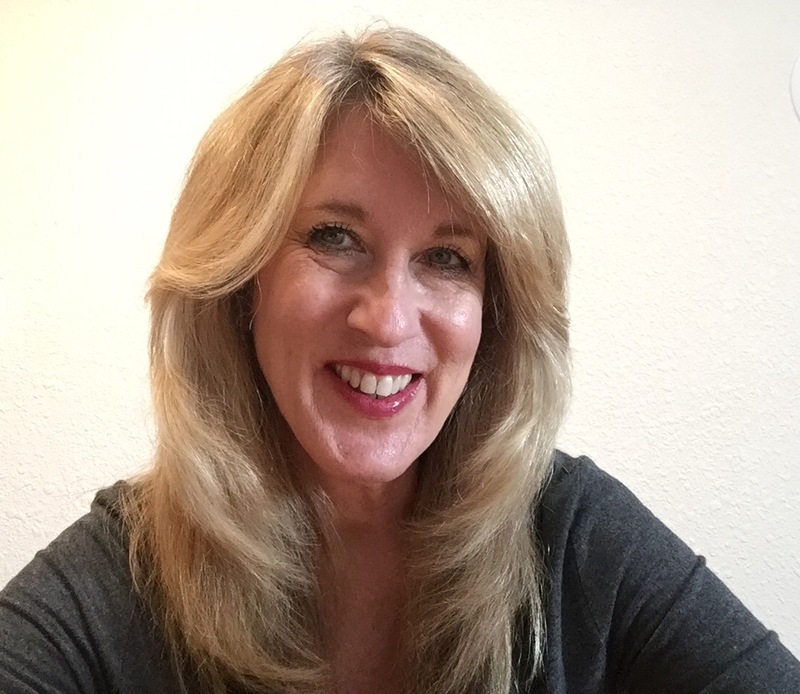 There are so many aspects of our lives that on the surface can seem simple, watching dogs run, a cup of tea on a cool rainy day, or even an outfit that makes us feel great each and every time we slip into it. I LOVE eggplant! I think it's great in so many dishes. I have an eggplant casserole that I will share in the near future. Makes the perfect side dish. 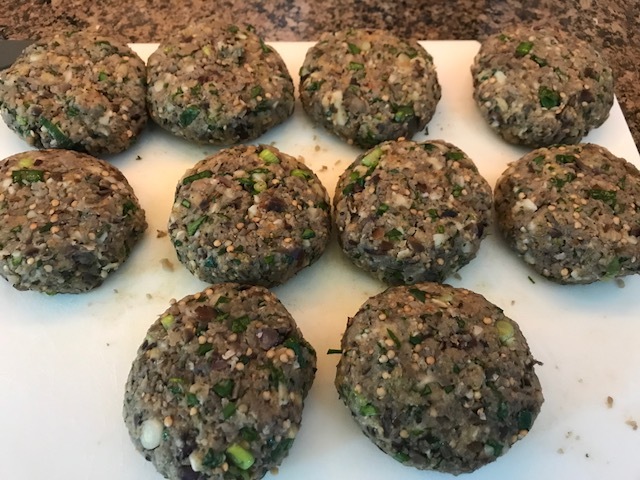 As I cooked the eggplant for the stew, the thought occurred to me, what if I pureed the eggplant and made it into patties? Well, I was not disappointed. What I ended up with was a patty that is great as a main dish, but will work well with pasta, and in a sandwich. When my husband tried the patty, he said, this is like Frikadellen, a German meat patty. To make the patties, begin with cubing the eggplant, and sprinkling it with salt. 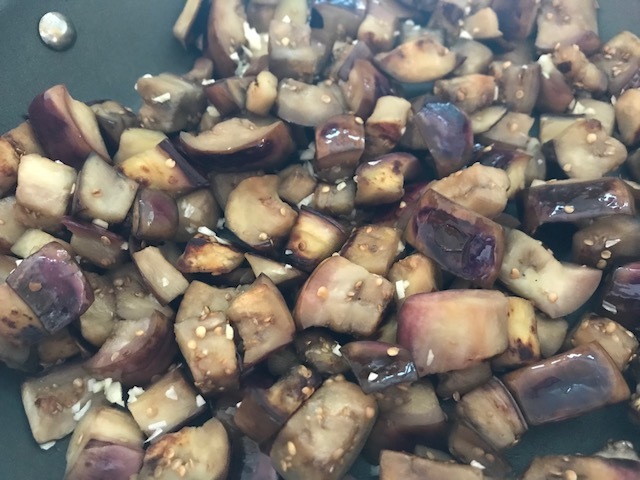 For this recipe, I allowed the salted eggplant to sit overnight in the refrigerator. The skin was left on the eggplant, why get rid of good vitamins? When I was ready to cook the eggplant, it was rinsed well and dried on paper towels. Olive oil was heated in a large pan. The eggplant added and cooked until golden brown. 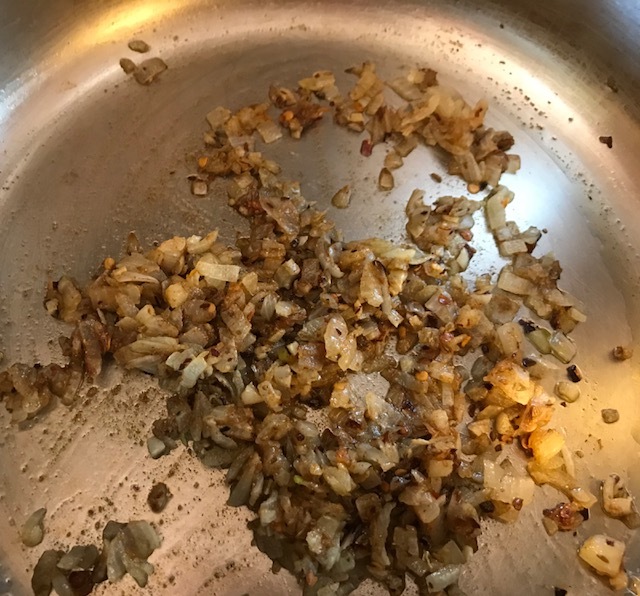 2 minced cloves of garlic were added and allowed to cook about a minute longer. 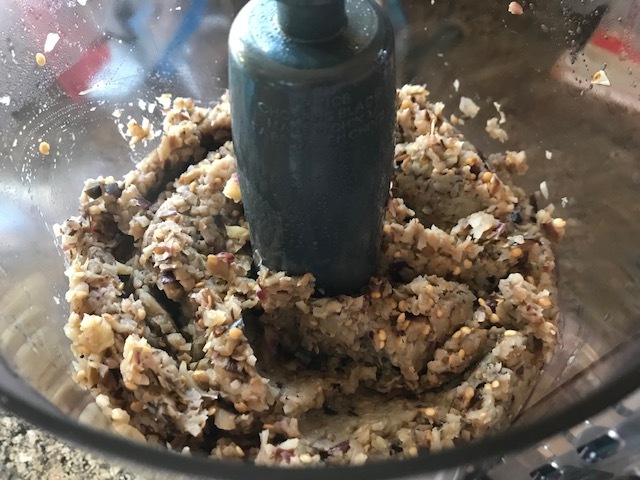 The eggplant/garlic mixture was then placed in a food processor and pureed until smooth. 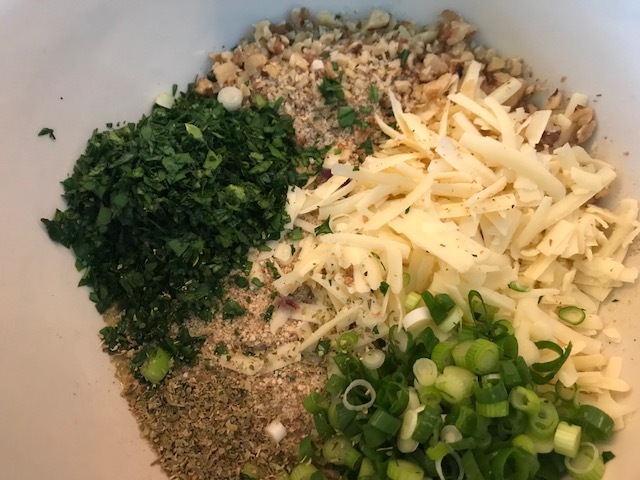 Beaten eggs, minced parsley, Italian bread crumbs, shredded sharp cheddar cheese, chopped walnuts, green onions, and dried oregano were mixed together. Then the pureed eggplant/garlic mixture was added, mixed well, and formed into patties. After cooking, I drained the patties on paper towels, and then dug in! The patties can be frozen prior to cooking, so cook what you would like, and save the rest for another meal. Place eggplant in a large bowl. Sprinkle with 1 tablespoon salt. Mix well. Cover and refrigerate overnight. Drain and rinse eggplant well. Dry on paper towels, or a clean kitchen towel. Heat 1 tablespoon of olive oil in a large nonstick pan. Add eggplant and cook until golden brown. Add garlic and saute another minute to release flavor. Place eggplant/garlic mixture in a food processor and blend until smooth. Set aside. Combine beaten eggs, shredded cheese, parsley, bread crumbs, walnuts, green onions, and oregano. Add pureed eggplant and mix well. Form mixture into hamburger sized patties. Heat 1 tablespoon of oil in large nonstick pan. 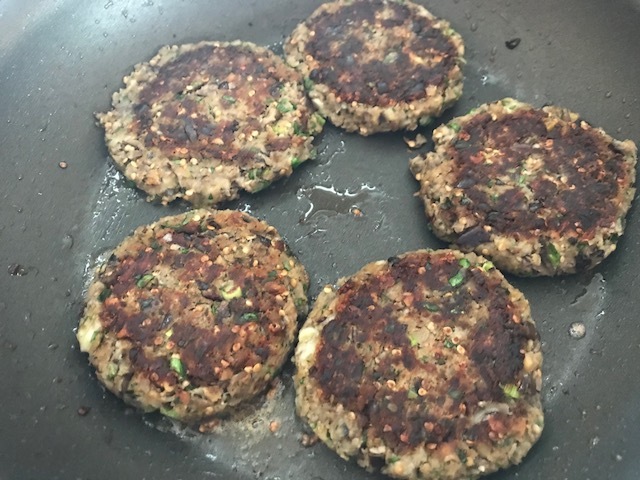 Place 5 patties in pan. Cook on each side until golden brown, about 3 minutes per side. Remove patties from pan and place on paper towels to drain. Repeat with remaining patties. Serve with mashed potatoes, or over pasta with your favorite tomato sauce. The patties are also delicious as a vegetarian burger! 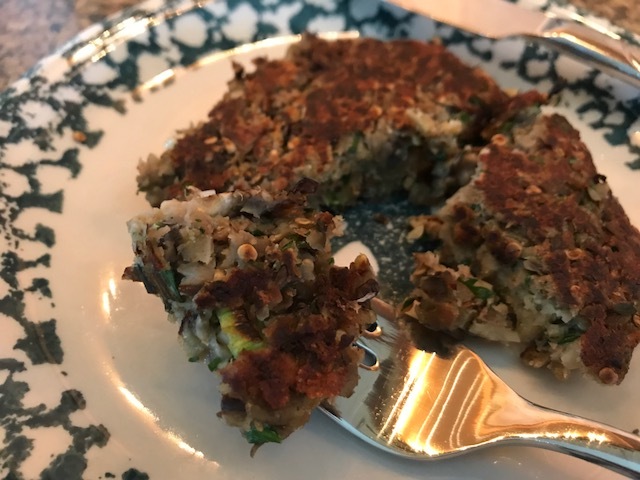 If you give the patties a try, I hope you enjoy them as much as I did! Where can sewing take you? To places you never dreamed possible. 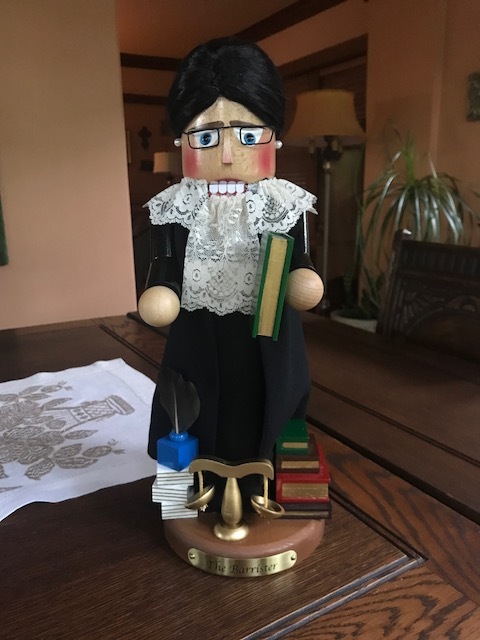 My friend brought the nutcracker home and then proceeded to give me a call to see if I could possibly turn the male nutcracker into a caricature of Ms. Ginsburg. If not, she would return the piece and call it a day. The first thing I needed to do was get rid of the powder style wig, and find a doll wig that would work. I then proceeded to pull off the robe and vest. Once I had him down to the wood, I could then figure out what to do. Originally, the little tie that is below the mouth is what you would pull to open the mouth. I took a piece of lace and made a tie of sorts. It was glued to the mouth so that it could then be pulled and the mouth would open. 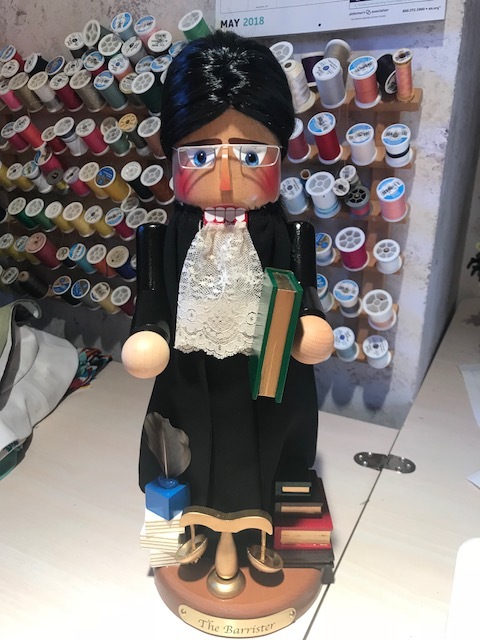 It's a little difficult to fit a wooden doll, especially when the arms won't move ;) So, I made a straight panel that was attached under the lace tie for the front of the robe. I then made a rectangle with slits on either side for the arms. It was all lined before being attached to the doll. The robe is fairly full (gathered at the neckline), as there is a lever in the back that moves when the mouth is opened. So there needed to be some volume to the robe in order for the lever to work properly. I then added a lace collar. 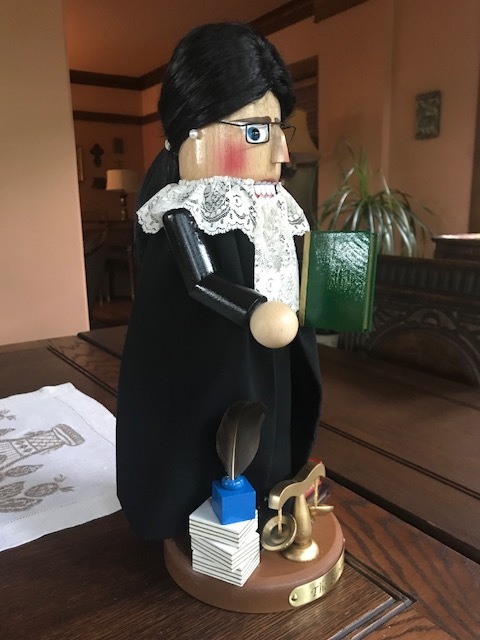 Not exactly what Ms. Ginsburg would wear, but it is a doll. I also noticed that in most of her pictures, Ms. Ginsburg wears dark rimmed glasses. I managed to take the glasses off of the doll and spray paint them black. The hair was pulled back into a ponytail. One thing that I noticed from all of Ms. Ginsburg's pictures was that she is always quite tailored in her appearance. So rather than tie a ribbon bow, I wrapped the ponytail with black ribbon and glued the ends down on the underneath side. The final touch, little pearl earrings. 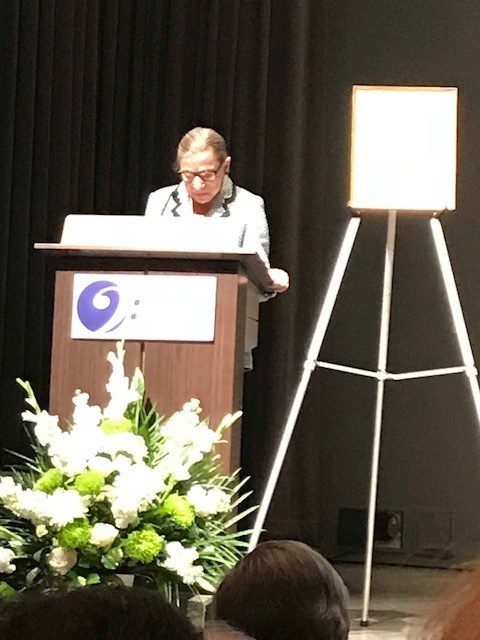 Ms. Ginsburg came to Chicago to present an award in the name of her late husband. I wish I had gotten a better picture of her. 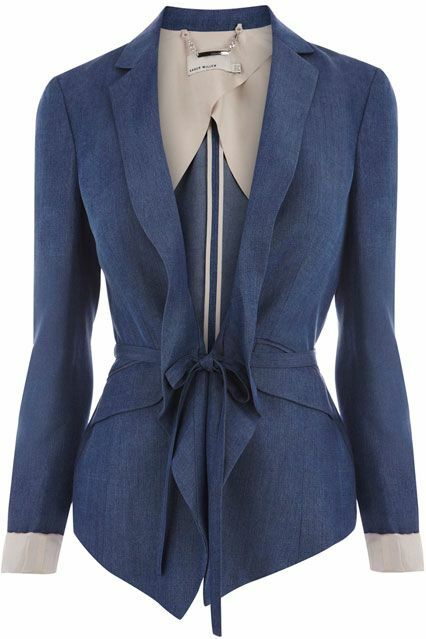 She was wearing a pair of beautifully tailored navy blue pants, and a gorgeous jacket trimmed in navy. My friend is pictured on the left below. An incredibly gracious and generous woman. 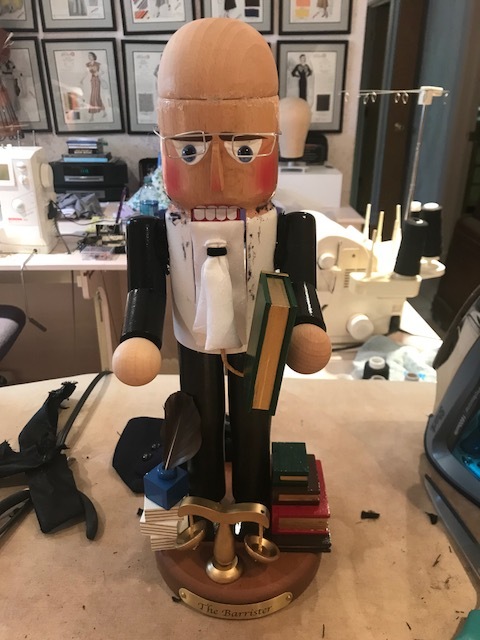 She had told me that she wanted me to present the nutcracker to Ms. Ginsburg. Such an honor! When the box was opened, Ms. Ginsburg was so happy. She immediately knew that it represented her. She said, "I love it!" And, it was apparent that she really meant what she said. She asked how to make the mouth open, and you see me showing her how to pull on the lace tie. Pictured in back of Ms. Ginsburg is her son. It was such a magical evening, and one that I will cherish for the rest of my life. Truly and honor. A few years ago, I looked around my dining room table on Christmas Eve and realized that everyone who was there was because of a sewing related experience. One was a dear friend who came to me as a client to make her wedding gown. Another felt that she would like to learn to sew, and took a tailoring class that I taught. The others were friends that I made through the Haute Couture Club of Chicago. I've told this story before, but it was because I made a suit for a nun that I ultimately became the president of the American Opera Society of Chicago. Seems unlikely, but it is true. And, I was the first in the 95 year history of the organization to serve a 6 year term. Sewing began as a passion instilled in me by my grandmother. It became a necessity when I was a teenager. Had I not sewed, I would have had very little to wear. 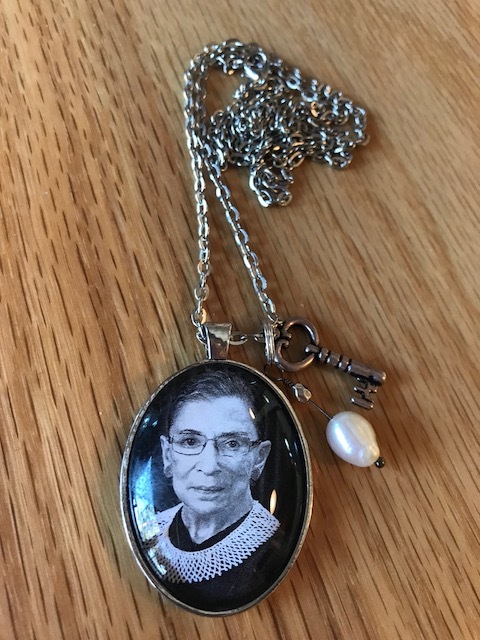 That teenager who saved her babysitting wages, sold greeting cards door to door, and mowed grass in the summer in order to have enough money to make the clothes that she needed for school would never have been able to imagine that her skills would one day lead to meeting a Supreme Court Justice, and even better, to meet someone as iconic as Ruth Bader Ginsburg. The necklace was made by Hollie Taylor. Her necklaces feature suffragettes, abolitionists, and trailblazers to educate about the collective power and accomplishments of women. 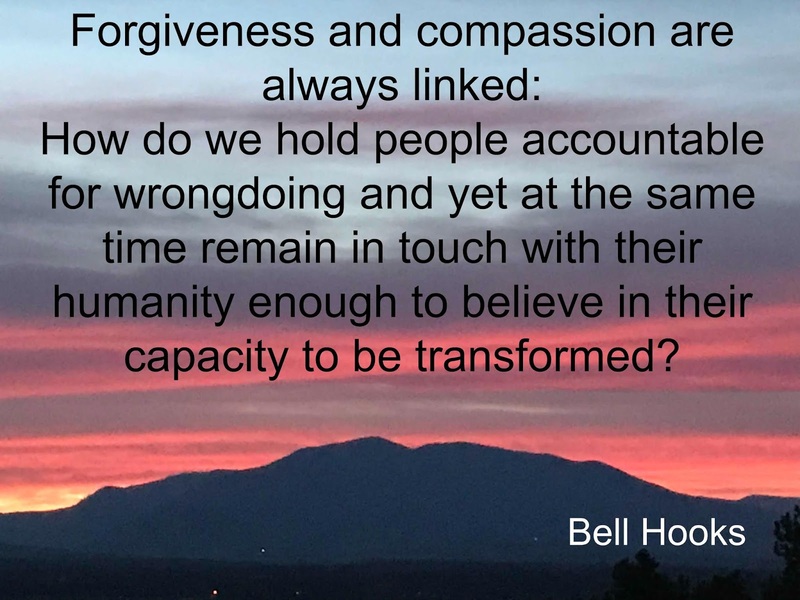 You can find her website HERE, and you can also find her on Instagram HERE. This is just the best time of year with all the fresh vegetables coming into the market. One that I love is eggplant. That rich purple color, the color of royalty, it is just so inviting. Today's soup is really more of a stew. Just the perfect dish for loading up on lots of vitamins for the coming months of winter. 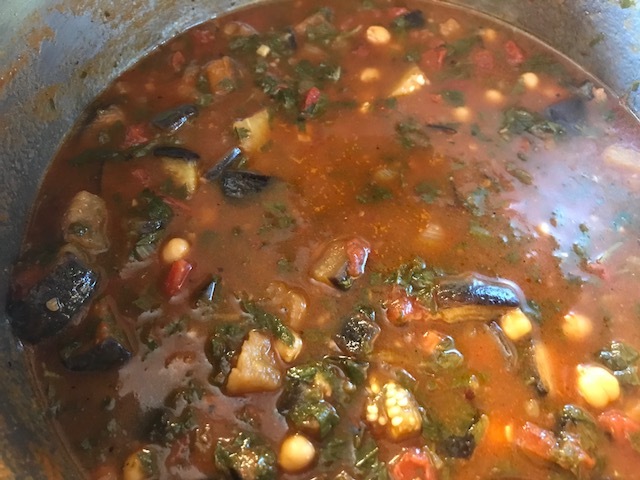 There's eggplant, baby kale, chickpeas, tomatoes, parsley, and lovely aromatic spices. 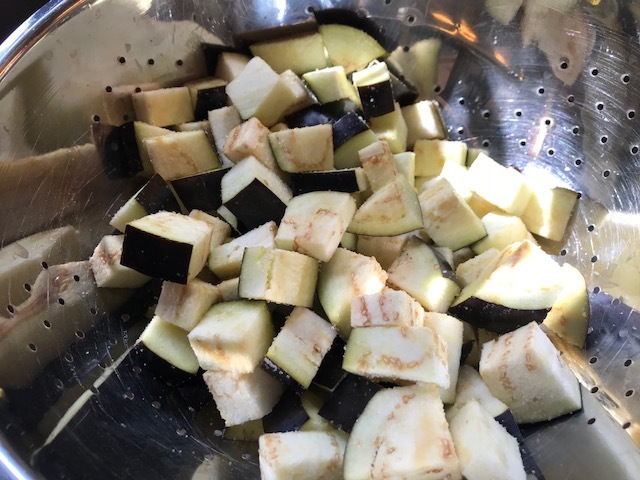 Begin by cutting the eggplant into bite size cubes. Place in a colander and pour 1 tablespoon of sea salt over the eggplant. Stir well to coat. Allow the eggplant to sit for 1 hour. While the eggplant is sitting, saute 1 medium chopped onion in 1 tablespoon of olive oil. 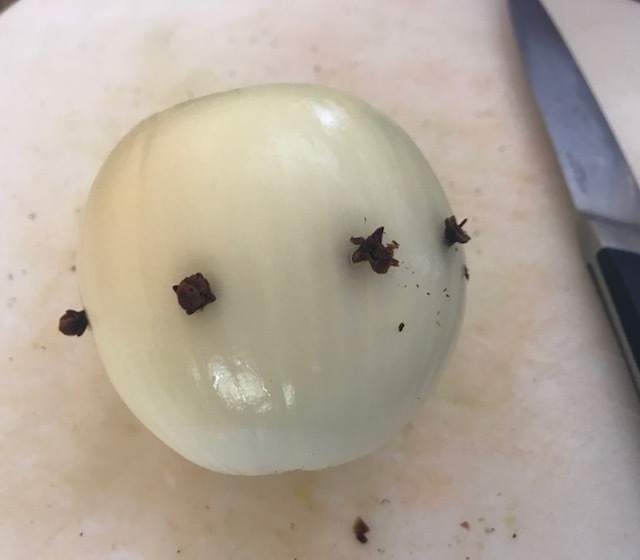 For this dish, I like to let my onion brown slightly. Add 3 chopped cloves of garlic and 1/4 teaspoon of crushed red pepper. Saute for about a minute to bring out the flavors of the garlic and red pepper. Now add the spices, cumin, coriander, and caraway seed. Add the chickpeas and saute for another minute allowing the spices to enhance the flavor of the chickpeas. Add the tomatoes, chopped kale, parsley, and vegetable broth. Bring to a boil, and then reduce heat to simmer. 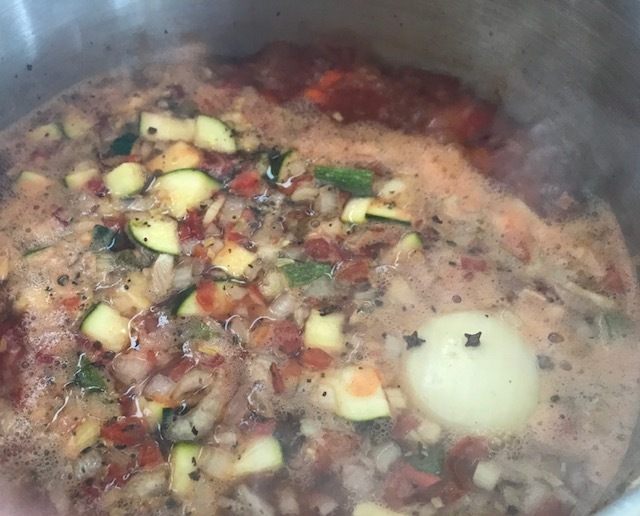 Allow soup to simmer until eggplant is ready. 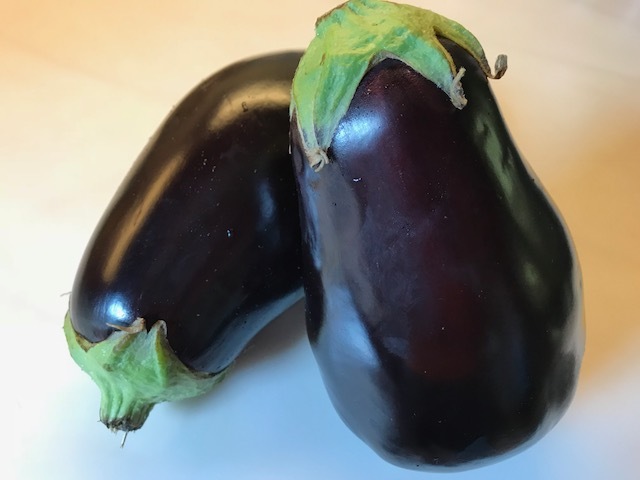 Once eggplant has sat for 1 hour, rinse well and then dry with paper towels, or a clean kitchen towel. Add a tablespoon of olive oil to a skillet. 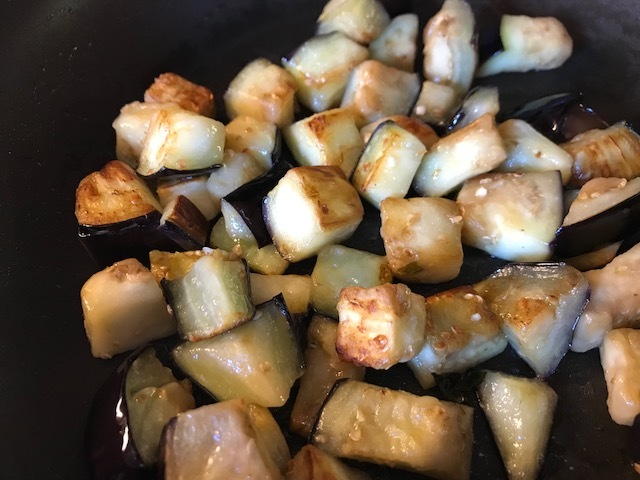 Cook eggplant in hot olive oil until nicely browned. This should be done in 2 batches,adding more olive oil to the second batch. Add the browned eggplant to the soup mixture. Bring to a boil once again, and then reduce heat and simmer for 20 minutes. Add salt and black pepper to taste. The soup is now ready to serve! If you would like, make a pot of brown rice and serve the soup/stew over the rice. Makes for a heartier meal. Begin by placing cubed eggplant in a colander. Sprinkle with 1 tablespoon of sea salt. Mix well to coat. Allow to sit for at least 1 hour. While eggplant is sitting, add 1 tablespoon of olive oil to large pot. Add chopped onion and saute until slightly browned. Add crushed red pepper and garlic. Saute for about a minute being careful not to burn. Add cumin, coriander, and caraway seed, stirring well to combine. Add chickpeas and and allow to cook with the spices for about a minute to infuse chickpeas with the spices. Add crushed tomatoes and vegetable broth. Bring to a boil and add chopped kale and chopped parsley. Reduce heat to a simmer and allow the stew to cook until eggplant is ready. Once eggplant is ready, rinse well with cold water. Drain on paper towels, or a clean kitchen towel. Divide in half. Place 1 tablespoon of olive oil in skillet. Add half of the eggplant and cook until browned. Add to stew mixture. Repeat with the remaining eggplant. Bring the stew to a boil once more. Reduce heat and allow to simmer for 20 minutes. Serve as is, or over brown rice for a heartier meal. Top the stew with a little fresh parsley and a bit of lemon juice. The soup will freeze well, so make up a big pot and have some on hand for later. Hope you enjoy the stew! I was home alone for the night, and feeling a little lonely, and it occurred to me that I could lock the door between my dressing room and my bedroom. The only entrance into my bedroom is through the dressing room. The lock that is on the door is a skeleton lock, after all the house was built in 1924. I had thought, "What a great idea! I will lock the door and sleep peacefully through the night." Not!!! I locked the door, and the lock jammed! I could not get the door open. I tried and tried, but no luck. I was trapped!!! I didn't sleep the rest of the night as I thinking about how I could get myself out. Finally, I remembered the attic window. Originally, this was the only way into the attic. Since we have had the house, we added a pull down staircase. I waited until the next morning, and devised a plan. At first I thought I could just climb up on my headboard as it is rather high, and attached to the wall. But, it was just a little too far for me to hoist myself up into the window. So, I decided to move my bed and then pull the armoire over. I then put a chair on top of the armoire. The problem then was to get myself up on the armoire. I then took another chair and put it on the bed. 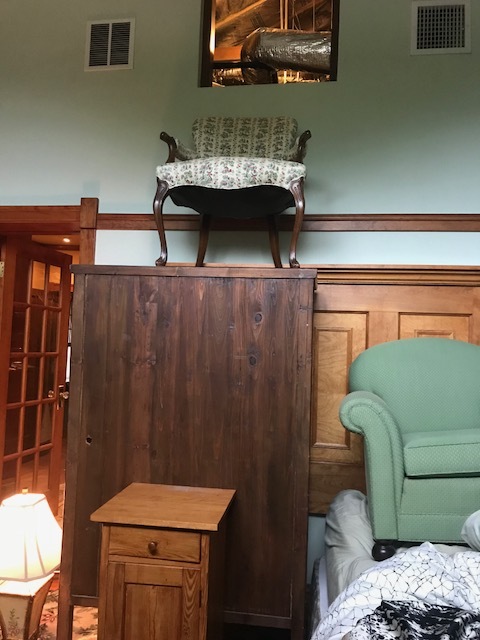 But, before I climbed up, I realized that the armoire wasn't as secure as it should be, so I moved my bedside table in back of the armoire to keep it from tilting over once I climbed up. Success!!! I was able to climb up and through the window. Last Saturday was the first meeting for the Haute Couture Club of Chicago after our summer hiatus. We had such a great meeting. Gregg Fishman of Fishman's Fabrics in Chicago was our guest speaker. He always brings a number of fabulous fabrics for us to purchase if we would like. I bought 2 pieces, a fabulous silk, and a lovely piece of autumn yellow wool. Years ago, I had a jacket made out of a piece of wool in this color and I literally wore it out. I wore it with everything, skirts, jeans, dresses. It was like the perfect piece. So, I was quite happy when I saw this piece in his pile of goodies. 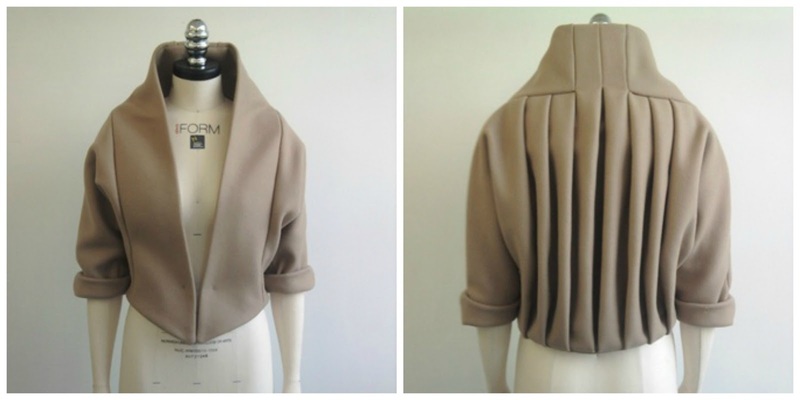 Now I am thinking of how I want to make this jacket. Since I'm looking for myself, I thought I would share some of what I found. I really love this jacket. 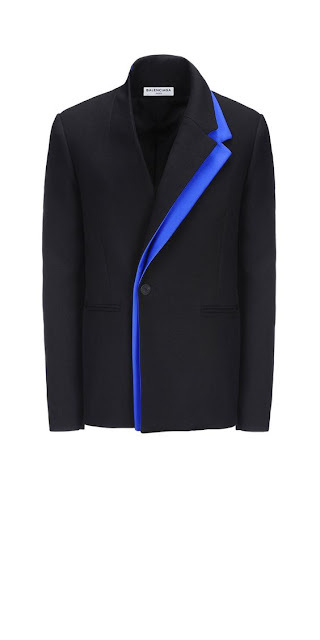 It's structured and yet soft, and I really like the elongated lapel. This jacket is so stunning. I love the pop of color. 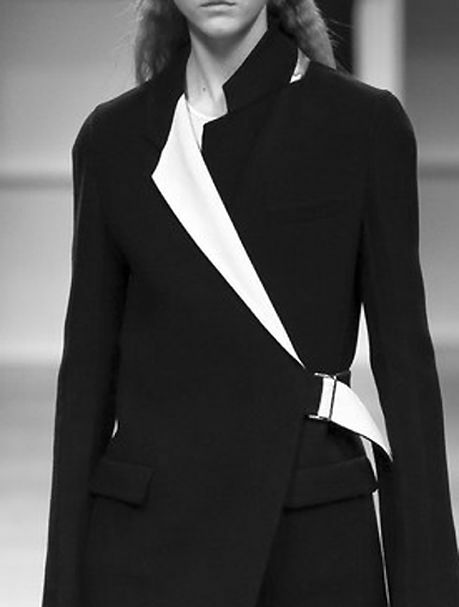 And I also like the asymmetrical aspect of the collar. This is a fabulous idea for a plaid. It's structured, it's soft, it has a play on the plaid, and I love the fringed edging. This is a great design. 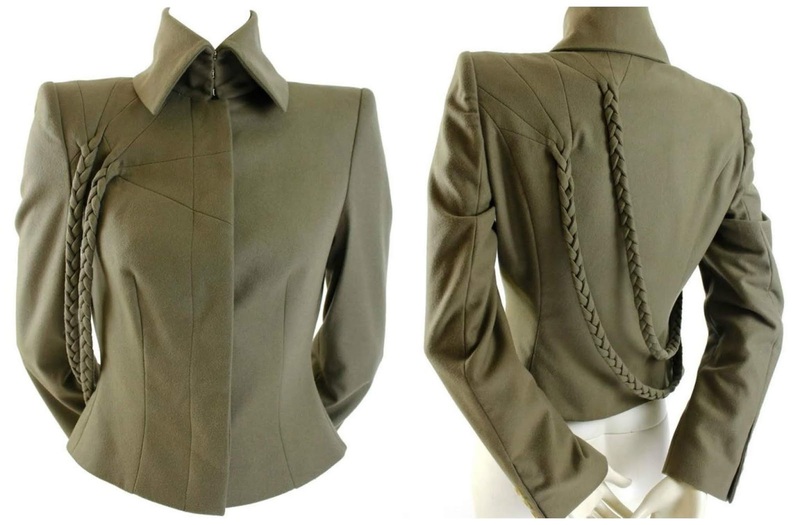 The collar is a true lapel collar, but it radiates out of the princess line seam. I rather like the odd little pocket on the seam, too! Another play on structured and soft. The lapel that kinda becomes a ruffle, and then the tie belt. Such fun! 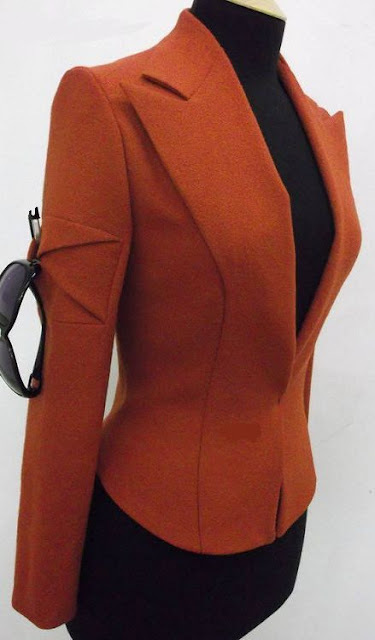 This is a basic tailored jacket with a little extra ease that is then pulled in with the side belts. Really pretty. Rather than having buttons, a side belt. The next 2 jackets are all out WOW!!! Talk about catch your eye! The braided...I'm not sure what to call them...I think are fabulous! 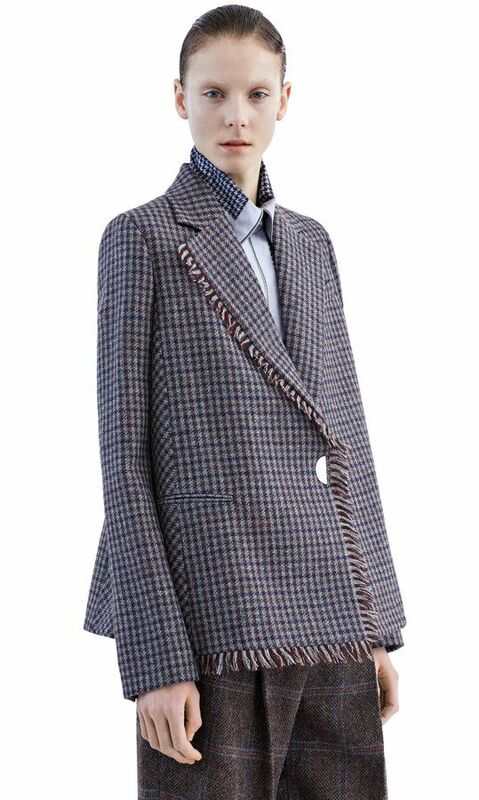 This jacket is so, so lovely. Such an amazing design. I am so very happy that structure jackets are coming back into vogue. I absolutely love being able to throw a jacket on with whatever I am wearing.